One of my co-workers had a son graduating from high school this year. This is the card I made for her to give to him. 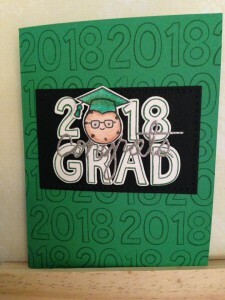 I used the school colors of green, white and black to make the card more personal. 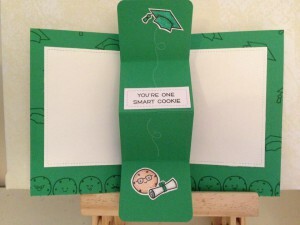 Extra Details: I began this card by creating a card base form some green card stock. 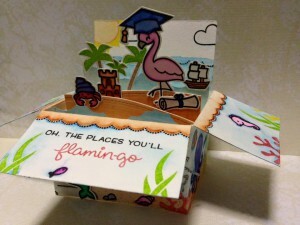 I used the same cardstock to die cut the Pivot Pop Up pieces as well. Using dark green ink, I added the 2018’s to the front of the card. 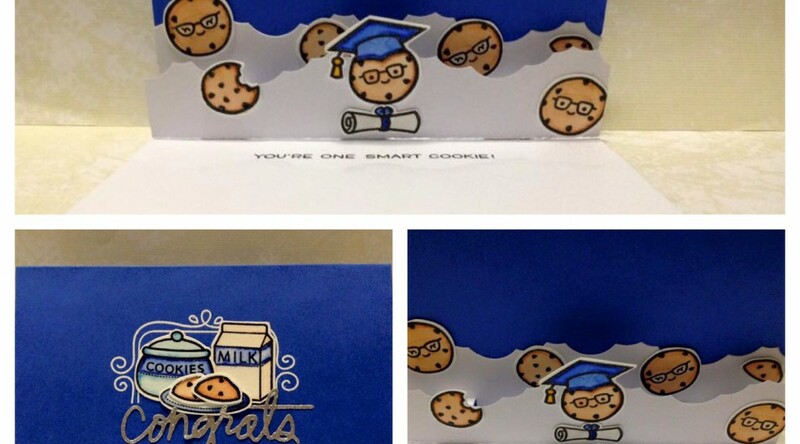 I used the same ink to add the cookies, and hats to the inside of the card as well. I used white pigment ink to add the dashed lines to the pop up panel. I plan on having the cookie “throw” his hat. 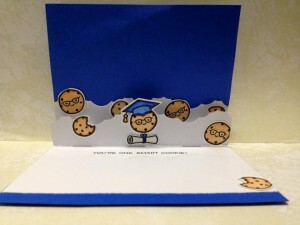 Using white card stock, I stamped the cookies, hats, diploma, letters and numbers. I used Primsacolor pencils to add color where needed. I used the matching die to cut out the letters and numbers and I fussy cut out everything else. While I had the die cutting machine out, I also cut two white stitched rectangles for the inside of the card, one small white stitched rectangle for the pop up panel and one black stitched rectangle for the front of the card. I found some silver glitter paper in my stash, that I die cut the word congrats from. Then I began assembling the card. 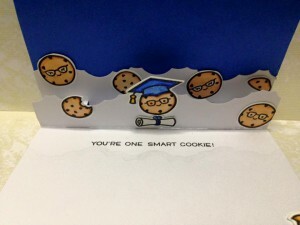 I used liquid glue, double sided tape, and just a little bit of foam tape on the cookie on the front of the card. Overall I really like this card and I know my co-workers will also. Ink: Lawn Fawn’s Jet Black, Yeti White Pigment Ink, and Nobel Fir. 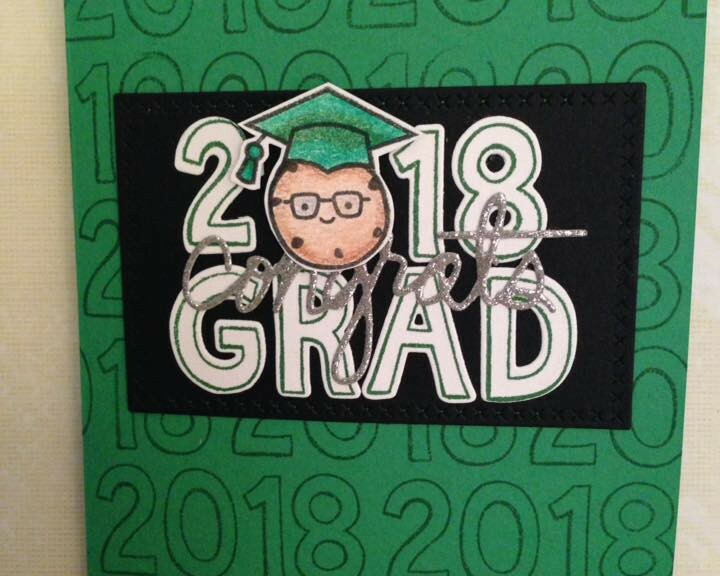 Yesterday, I made a graduation card for my daughter, even if she doesn’t know it yet. So today, I made one for my son. He will be “graduating” Kindergarten this year. 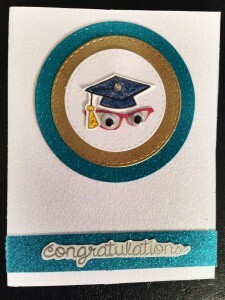 Extra Details: I started by stamping and clear embossing all of the images for this card. I used Crayola Fine Line markers and a water brush to water color these images. Once they were dry, I fussy cut everything out. Then I began working on the card base. I started with a dark blue card base. On the front, I partially stamped a frame in Versa Mark, and then white heat embossed it. I layered some of the images in the frame. I die cut “congrats” from silver glitter paper. I adhered this right under the images and the card front was done. For the pop up feature on the inside of the card, I started with a white card base. I die cut a “wave” using the puffy cloud border die. Using the negative piece, I die cut another “wave” to pop up. I used the Everyday Pop Up Dies to create the pop up tabs on the white card base. I adhered the second “wave” to the pop up tabs. Next, I adhered the cookie images to the two “waves.” Before adhering the pop up element to the blue card base, I trimmed the straight edge to better fit in the blue card base. Lastly, I adhered the pop up panel and stamped the sentiment inside. 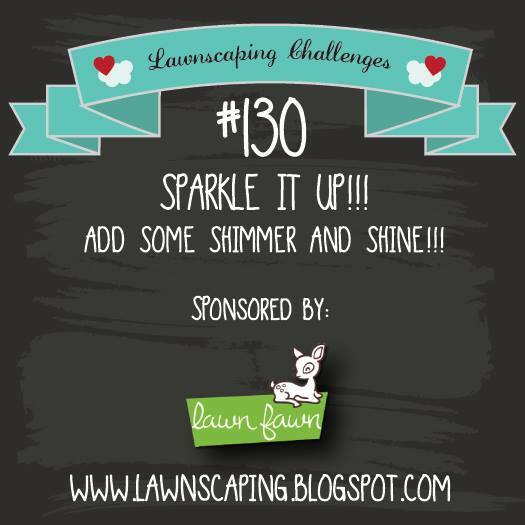 I had fun with the Lawn Fawn Box Card Pop Up Die again today. 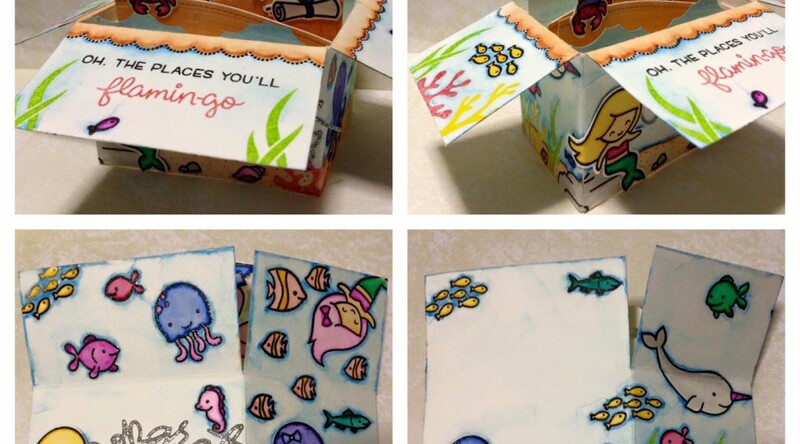 I love the idea of a surprise inside the card; which is why the outside looks like an underwater scene and the inside has a hidden island. Extra Details: I began by die cutting all of the basic pieces for the card base from water color paper. I did not cut any of the stitched rectangles as I planned on decorating the whole card base. 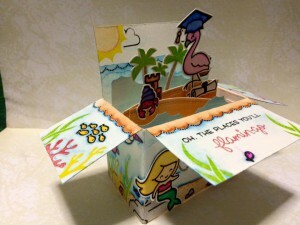 I did die cut one stitched hillside and one puffy cloud border to use on the inside of the box. 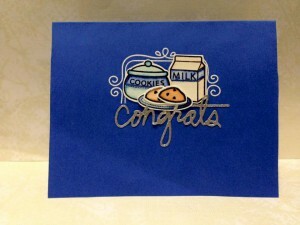 I also die cut “Congrats” from silver glitter paper. Then I began stamping. Mostly, I used Versa Fine Ink for the stamping. I also used Simon Says Stamp Hybrid Inks for the colored inks. I used clear embossing powder on everything, so I could begin water coloring faster. Most of the images are stamped right on the card base. 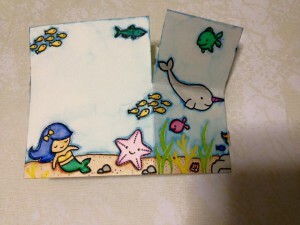 I stamped the images for the inside of the card on a scrap of water color paper. I did also re stamp one of the mermaids on the scrap of water color paper, after I messed up stamping her on the card base. I used Crayola Fine Line Markers and a water brush to water color everything. 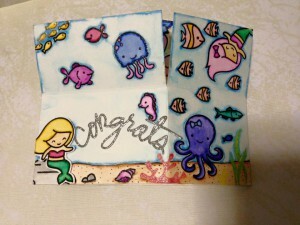 Once everything was dry, I fussy cut out the images for the inside of the card and the mermaid. Then I assembled the card. Because I decorate the card base itself, the assembly didn’t take that long. I LOVE this card and so does my daughter. She tried talking me into giving it to her now. Extra Details: I used gold embossing powder on the second circle. The sentiment is done in silver embossing powder. The pink glasses are coated in clear embossing powder. The hat and tassel are covered in glitter glue. 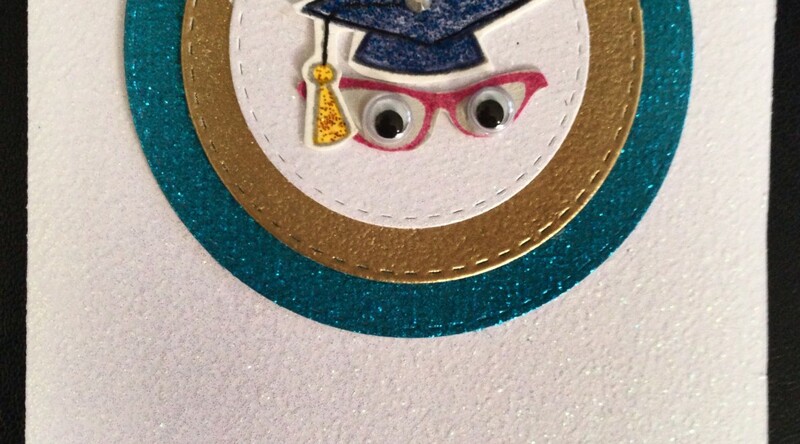 I put a small gemstone on the hat and googly eyes on the card as finishing touches.